Want to start a folk sing? Hey look! There’s a new Folk Sing Starter Kit! It has great suggestions for forming singing communities and events, encouraging new singers, finding venues to sing in, and more. If you want to hear some great old voices check out the resources section, which is full of links to good source recordings, podcasts, and other listening. You’ll find an amazing amount of information organized under handy subheadings, making the kit equally suitable for browsing or avid study. Whether you want to get together with a few friends or are thinking of starting a public singing session in your neighborhood you’ll find some tips to get you started. The truth is that I was nervous about writing this kit. There are countless styles of song gatherings and ever so many genres of folk music, and singers can have strong preferences and affinities for a particular format. Eventually my attention turned toward how we sort out our different expectations or preferences every time we get together to create a new event, and that is the basis of this starter kit. Clarifying our expectations and communicating with one another helps us create community and awesome singing in spite of our different singing backgrounds. This starter kit necessarily reflects the singing interests of its authors (myself and Nicole Singer), but it is fundamentally about how you can communicate your vision to create a group sing that reflects your own musical and social interests. I am an obsessively enthusiastic folk singer. The voice is the instrument we were born with and I think of group singing as the essential creative collaboration. I wish a capella singing were a universal pleasure, but instead some people feel uncomfortably exposed or unconfident when singing alone, or simply feel that a solo voice makes an incomplete musical sound. Thankfully these opinions can change with a little coaxing. 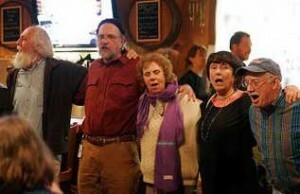 Instead of emphasizing virtuosic vocal tricks, many forms of folk singing encourage full-hearted voices. A capella folk singing lets people get in touch with all the sounds they can make in pursuit of self expression beyond language. CDSS Folk Music Week has been a guiding force in my life. I’m thrilled that when people ask where I learn my songs, how I formed opinions on singing styles, and why singing is essential to me, I can now direct them to the CDSS website for information about folk singing. This kit was put together with input from as many singers as I could wrangle. If you read it and have something else to add, please get in touch, using the contact info on the kit’s top page. 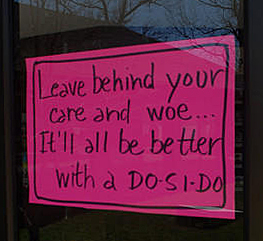 This entry was posted in Guest Posts, Ideas & Resources on January 26, 2012 by Lynn Nichols. Summer’s coming! Which week is yours? The days are getting longer and summer is just around the corner! Our 2012 CDSS summer camp details are now available — you’ll find descriptions and staff lists for each session, info about Registration and Scholarships, and more. With 16 programs in 9 weeks at 3 facilities, we have something for YOU. Take your singing, your dancing, your music making to a new level. Discover a tune, a dance, a song and take it home to share. At camp, people make and maintain life-long friendships; which week is YOURS? It may be one you haven’t tried yet! There is a new generation in charge of our oldest week. In 1976, Jim Morrison led his generation as he took the reins of English & American Dance Week. Look who is in charge this year! Jim’s son, Owen, by my count, has been to 47 of our camp weeks and has only missed 3 of his 29 summers. He went from staff family to staff at age 19 in 2002 and, with his mother, Marney, was Program Director of Family Week in 2008 and 2009. And that is just the CDSS weeks; he is a regular at CCDS in Berea, KY, and a sought after staff member everywhere! He brings a wealth of experience and skills to the position of Program Director. This year’s E&A Week includes a focus on percussive dance, offering six classes on traditions from the US, England and Canada. Kimberley Fraser will teach Cape Breton Step Dance, Leela Grace will teach beginning and advanced levels of Appalachian Clog, Yaëlle Azoulay will teach Advanced and Intermediate Quebecois Step Dance, and Gillian Stewart will teach Rapper. There is still the full complement of English Country, contras and squares, morris dancing, singing and instrument work. 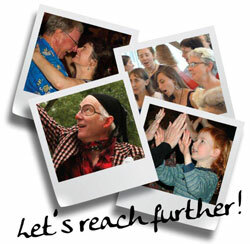 We will expand on all that we enjoyed last year, our debut of Harmony of Song & Dance. The All Camp Chorale features the full camp in C# Minor, with songbooks in hand, following the lead of one staff member after another (but with more time than last year). By the end of the week, we sing the full variety of presented songs with the conviction of a group who knows the song and knows why we know it. This is truly making music together, and a strong expression of community. This year Brad Foster is using this week to teach a Course for English Dance Leaders. What better training ground could we find? Here English dance leaders learn the importance of song to their job and can observe the teaching styles of so many leaders. This year our Timber Ridge program has many exciting additions. Beyond the family program that has been so popular, and the adult program in English & American dance that is so much fuller than any we can offer at the smaller Family Weeks at Pinewoods and Ogontz, we have three exciting mini Courses! Eden MacAdam-Somer and Larry Unger will lead their American Dance Musicians Course which was such a success at Pinewoods last summer – Eden and Larry more than made up for the days lost to Tropical Storm Irene with the many extra hours and focused attention they gave the students. Sixteen pre-registered musicians will benefit from their wisdom this year! 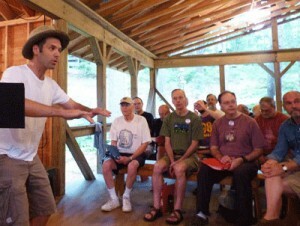 Nils Fredland and Ralph Sweet are bringing the Singing Squares Callers Course to Timber Ridge as well. Singing Squares are returning with a vengeance and these two know what they are talking about! Their collaboration on the book On the Beat with Ralph Sweet helped get this program off the ground. Gaye Fifer and Adina Gordon will lead Leadership in Dance & Music for Young Adults, taking 20 future leaders on a journey to enhance their leadership in the community from the stage, the dance floor, and the planning of dance and song events. Each of these special Courses requires specific registration. It is important to clearly state if you want to attend the host week if you do not get into the Course. The Courses do have prerequisites, so any lottery will be among the qualifying applicants. I have tried to explain the details on our Course pages, but feel free to contact me with any questions. This entry was posted in Camps & Programs, Updates from the Office, Youth on January 21, 2012 by Lynn Nichols. This week I head to Minneapolis with former youth intern Ethan Hazzard-Watkins. Our destination: Tapestry Folkdance Center. Our mission: youth outreach! 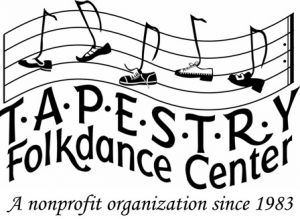 Tapestry is a non-profit organization which has been teaching and supporting folk dance and music since 1983. 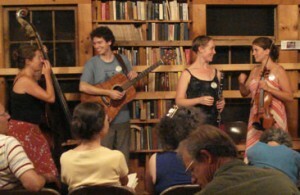 In 1999 the organization purchased a building in South Minneapolis where contra, English country, international folk, Cajun and nordic dances, as well as other folk music events, are regularly hosted. 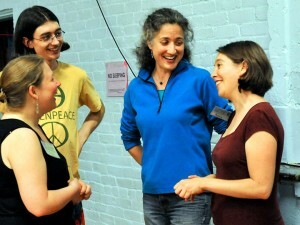 It is rare for such a diverse dance community to have a physical center. I am eager to meet the people who have realized this dream and even more excited to dance with them. hosting dances on several local college campuses over the next year. Tapestry asked Ethan to come visit the Center as a consultant in this project and Ethan in turn asked me, the current Youth Intern, to join him to represent CDSS. So many communities in the CDSS neighborhood are asking the question “How can we involve more young people in our traditions?” I believe Tapestry’s intentional and focused campaign to integrate youth into their constituency will be a valuable case study, both as an example to other communities facing similar questions and also as an opportunity for CDSS to become better acquainted with another vibrant dance community and learn the best ways for us to offer our support. Watch my Facebook page for live updates from the Midwest this weekend, and read a follow-up report here on the blog following my return! This entry was posted in Features & Fun, Updates from the Office, Youth on January 19, 2012 by Lynn Nichols. Mary Jones and I unloaded and set up the CDSS bookstore on Friday afternoon and then waited for the fun to start. Turns out, sitting at the bookstore table is a great place to meet and chat with people. the room’s set up so you can easily see and hear the dancing and the music, and is right next to the room with the food and coffee. The bookstore room also has the most comfortable chairs so, with delight, we hosted a sleeping Bob McQuillen more than once. There is superb dancing at this weekend — this is what everyone comments on, and now I’ve experienced it too. Many of the attendees have been dancing longer than I have been alive and their poise and deep appreciation of the dance are evident — there is great attentiveness to the music, style, and and form of each dance. I loved meeting the older members of the community, while absolutely enjoying the spirit of the youngest. Workshops complemented the dancing, and the banquet was a more than pleasant surprise; we all managed to get dressed up, as dancers do — flashy with sequins and tartans, while still wearing our sneakers and comfy shoes! Our newest youth intern, Mary Wesley, spoke from the caller’s mic about CDSS; Adina Gordon, our office manager in spring and summer 2011, was a featured caller; and Max Newman, last year’s youth intern, was both a workshop presenter and is part of Nor’easter, one of the featured bands. Yeh, CDSS — we sure know how to pick great people to work with! My strongest impression? I smiled most of the weekend. CDSS Board Member, David Smukler, asked me how I was doing and my answer, without any hesitation, was “really great.” I liked the vibe — non-competitive, inclusive dancing and friendly people is what we all hope to experience and I found it. At the end of the day on Sunday, Mary and I re-packed our books and cds; really tired but grateful to have taken part in this event. Congrats to all the organizers and volunteers who make this a wonderful weekend. 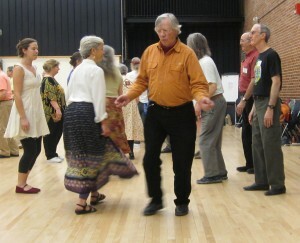 This entry was posted in Features & Fun, Updates from the Office and tagged contra dance, ralph page on January 18, 2012 by Lynn Nichols. 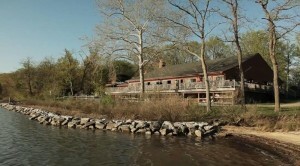 The Folklore Society of Greater Washington’s annual Chesapeake Dance Weekend (CDW), held each April near Annapolis, MD, will celebrate its 30th anniversary in 2012. See Joel Bluestein’s article in the Winter 2012 issue of the CDSS News on the weekend’s history, and Doug Plummer’s 2010 video, “Love from Thin Air.” Enjoy! One score and ten years ago our friends brought forth on this dancefloor, a new notion, conceived in fun, and dedicated to the proposition that music and dance can be enjoyed equally. Now we are engaged in a great weekend, testing whether that notion, or any notion so conceived and so dedicated, can long endure. We are met on a great dancefloor of that weekend. We have come to dedicate a portion of that weekend, as a recognition for those who here gave their time that that notion might live. It is altogether fitting and proper that we should do this. But, in a larger sense, we can not dedicate─we can not consecrate─we can not hallow─this dancefloor. The great dancers, living and dead, who danced here, have consecrated it, far above our poor power to add or detract. The world will little note, nor long remember what we say here, but it can never forget how they danced here. It is for us the living, rather, to be dedicated here to the unfinished fun which they who danced here have thus far so nobly advanced. It is rather for us to be here dedicated to the great task remaining before us─that from these honored dancers we take increased devotion to that cause for which they gave the last full measure of devotion─that we here highly resolve that these dancers shall not have danced in vain─that this weekend, shall have a new birth of energy─and that dancing of the people, by the people, for the people, shall not perish from the earth. "Leave behind your care and woe..."
The Chesapeake Address was composed by Joel Bluestein, Washington, DC area dancer, musician and one of the weekend’s founders. The big event will be April 13-15, 2012. This entry was posted in Features & Fun on January 17, 2012 by Lynn Nichols. I’m delighted to let you all know that we met and surpassed our goal for end-of-year giving to the annual appeal! Your generous donations, along with the Board’s matching challenge in May, successful fundraising for Scholarships & Special projects at camp this summer, and a surge in membership in the last quarter of the year gave CDSS a strong finish in 2011. We are off and running in 2012! Steve has just posted the latest camp information for 2012 on the web and registrations are coming in; Jeff has reopened the store with lots of new inventory; Pat and Nils are madly editing another collection of singing squares; Caroline has sent the Members Directory to the printer (for those who wanted a copy) and is working on the camp brochure; Linda is reviewing more than a dozen grant applications that came in before the January 1 deadline; Mary will soon be heading to Tapestry Folkdance Residency as a co-consultant, with Ethan Hazzard-Watkins, to their youth outreach campaign; and the Search Committee of the Board is preparing to interview candidates for the Executive Director position. It’s going to be a GREAT year. With your help, we will continue to reach further! Many thanks, dear friends, for your continuing support. 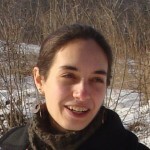 This entry was posted in Membership & Development, Updates from the Office on January 6, 2012 by Lynn Nichols.